SOA Facts - One of the most hilarious websites! This has been one of the most hilarious websites I've seen so far. For those who are still looking at the roof and scratching your head, wondering what this three letter thing is - SOA refers to Service Oriented Architecture. "SOA is an IT architectural style that supports service orientation" - thats how the official definition of SOA goes. For those people who have just entered the IT industry, its something that is in the lines of the well known OOP (Object Oriented Programming) concept. "Implementing SOA for the first time is the triumph of imagination over intelligence. A good read during breaks. Share it with your SOA comrades. A land where two and four+ wheelers exist in peace! China is the country that competes closely with India in more than a way. Two-wheelers like cycles and bikes are one of them. China has as many (or greater) two-wheeler traffic on the road as India has. But the road-safety ensured for these two-wheelers is far greater than what is ensured in India. The roads in Shanghai has typically four lanes. The two of the outer lanes are the ones used by the two-wheelers. These outer lanes are separated from the ones in the middle by a solid metal railing that runs continuously along the length of the road. An interesting thing can be observed at the junctions where roads meet - the two-wheelers cross over to the other side using the pedestrian crossing (zebra crossing). Parking spaces are available for cycles along the sides of the road, where a nominal charge is levied on an hourly basis. The book stores are sights-to-see for anyone who makes it to the financial capital of China - Shanghai. A walk into any bookstore at any time of the day is like walking through narrow streets packed with people. Bookstores reveal the true side of the geek land. Every aisle in the book store had dozens of geeks standing, sitting, squatting and reading books! Walking through the narrow aisles was a challenging task most of the time. Given this kind of a marketplace, I have been wondering the motivation behind opening a bookstore in Shanghai. It might be profitable to open a library - Won't it? The other interesting observation was that they listed GMAT/ GRE/ SAT books under a section called "Kids Books"! Smart kids indeed! This is my first posting after my Shanghai travel, and thought it would be good to share the welcome experience I had at Pudong International Airport. I'd reached the airport at about 13:35 Hrs, and waited for my colleague who was arriving from the United States. 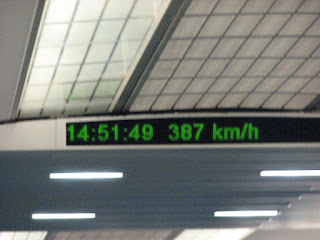 I'd read a lot about the Shanghai Maglev Train, and hence decided to experience the speed. The Shanghai Maglev Train station is connected to the airport, and we were there in less than 5 minutes. 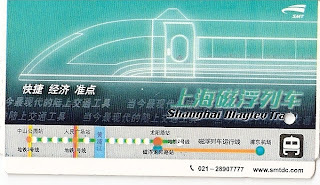 The train operates on one route, which is the Pudong International Airport - Longyang Road link. 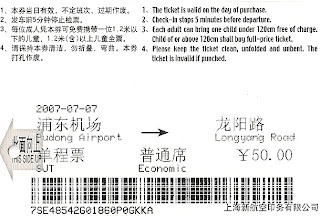 We took the one-way ticket which costed CNY 50 (INR 267/ USD 6.5). This was one of the most thrilling experience I've had so far. We were allowed to enter the track area only after the train arrived at the station. The station had a railing that prevented the movement of people anywhere near the tracks. The train looked like a mini Boeing jet to me. We boarded the train, and in less than a minute, we heard the bell and the doors closed. The train had one more uniqueness - it had a digital tachometer displayed inside. I didn't even realize the speed at which the train was moving, until I saw the tachometer. But for the tachometer, I'd never have realized the train speed. It was such a smooth ride, that it felt like traveling in a jet. For long, the jets have been known for their speed - Airbus 380 travels at a maximum speed of 0.89 Mach (590mph). The Maglev train travels at a maximum speed of 268mph (431km/h) - almost 50% as fast as a Boeing 380. If you happen to go to Shanghai, make it a point to take this wonder machine from PIA to Longyang Road, and then take a cab from Longyang Road station. Finally I got back to Chennai after a week of travel. Look forward to share my Shanghai experiences soon. Got to catch up with some good sleep now. Will hope to give some steaming news from Shanghai. If not, will catch up with my net presence after I return on the 11th July. I wonder...how our lives would be without a vehicle to drive, electricity to power the many appliances at home and office! Truly, man has become subservient to machine and technology. If man, who once lived by lighting fire using a couple of stones, is so much dependent on technology and machine today, it's himself to blame. I sometimes feel that world would've been a far better place to live sans these inventions. Lighting a cigarette with two stones, and moving from one town to another by walk would've definitely stopped the advent of lung cancer, obesity and global warming, to name a few.